The Berkeley was a very popular British sports car. Its constructor, Laurie Bond was one of the more successful designers of mini cars in England. In the 40's, Bond raced successfully in a mountain race and decided to create a light 2-seat roadster with a fiberglass body, a 2-stroke motor and front-wheel drive. In 1956 he joined with Charles Panter, owner of Europe's largest manufacturer of caravans, who wanted to offset seasonal sales variations by producing a car. Production began with 3 prototypes, the bodies of which were made of two plastic parts, with a box-shaped substructure and suspension and engine compartment reinforced with aluminum, forming a fiberglass monocoque structure. The headlights were under plexiglass covers. The first Berkeleys, the B60s, were 4-wheelers and had 322cc Anzani 2-stroke, 2-cylinder motors with 15 horsepower and chain drive to the front wheels. These in turn were hung on A-arms, suspended by Girling coil-and-damper units. At the rear there were swing axles, with struts. It was named B60 for its top speed, and the B65, with 328cc Excelsior motor, soon followed. A 492cc version was created by the addition of a third cylinder. 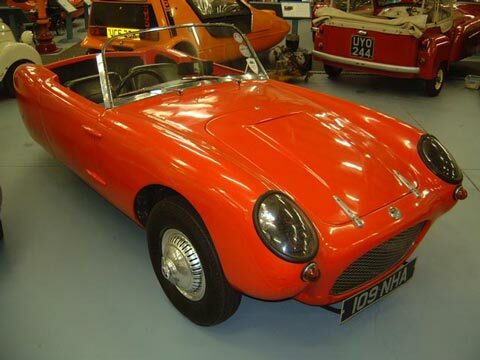 Production was stopped by the arrival of the Austin Healey Sprite. When production resumed, the B65 had become the T60, a 3-wheeler, able to be driven on a motorcycle license. The slightly longer body had a bit of room behind the front seats and very rare T60/4 (only 40 made) had actual child seats over the rear wheel. The 3-wheelers were a great success, and were produced in the largest numbers.